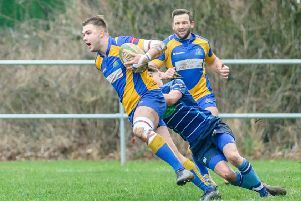 The hosts scored five tries with Alex Selby adding 11 points from the boot in a game which doubled as the semi-final of the Warwickshire Shield. 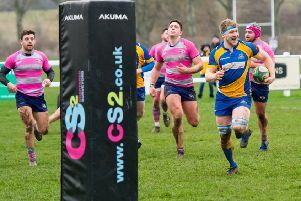 Kenilworth started the match strongly, coming away with three points from their first foray into Silhillians’ territory, fly-half Alex Selby slottting over the penalty after four minutes of play. David Ellis’ men continued to dominate the opening 15 minutes, with the majority of both possession and territory. Silhillians looked dangerous mid-way through the first half but resolute defence kept the visitors at bay and Kenilworth finished the opening 40 strongly with two tries in as many minutes. The first of these came after a superb inside pass from Selby released captain Bobby Thompson into space in the middle of the park just outside the Silhillians 22. Dave Bromfield was in support to receive Thompson’s pass and an excellent take saw the prop race towards the line and touch down by the posts. Selby added the extras. The second saw Thompson go from provider to scorer with the number eight crossing after a rolling maul made good ground in Silhillians’ 22. Selby once again slotted the conversion as Kenilworth went into the break with a commanding 24-0 lead. Silhillians started the second half brightly but Kenilworth remained in control in the opening stages as they looked to secure the try bonus point. The visitors then enjoyed a sustained period of pressure in the Kenilworth half and eventually capitalised in the 53rd minute. A sublime line from David McNidder sliced the Kenilworth defence in two and the outside-centre touched down under the uprights for what would be his side’s only try. The conversion cut the deficit to 17 points. Kenilworth snuffed out any ideas of a Silhillians comeback, however, with a series of drives from the forwards allowing scrum-half Gareth Renowden to go over. Selby added the two points from the tee. With the bonus point secured, Kenilworth did not let up and Ed Hannam completed the scoring for the afternoon with two minutes remaining. Great passing from the back line released Hannam into space on the right and the number 13 went over in the corner to seal an impressive victory. Kenilworth have a break from league action tomorrow when they travel to Olney in the Midlands semi-final of the Intermediate Cup (2.15pm).